Shared mailboxes in Office 365 make it easy for a group of people to monitor and send email from a common email addresses, like info@contoso.com, support@fourthcoffee.com or contact@contoso.com. When a person in the group replies to a message sent to the shared mailbox, the email appears to be from the shared mailbox, not from the individual user. Shared mailboxes are a great way to handle customer email questions because several people in your organization can share the responsibility of monitoring the mailbox and responding to the questions. Your customer questions get quicker answers, and related emails are all stored in one mailbox. A shared mailbox is tied to a disabled user account and doesn't have its own user name and password. Users can't log into a shared mailbox directly using Outlook or Outlook on the web. You must first assign permissions to the user to access the shared mailbox, and then they can access it using Outlook or Outlook on the web. You don’t need to assign licenses to shared mailboxes, except when they are over their storage quota of 50 gigabytes (GB). 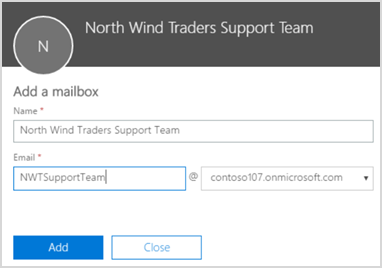 For more information, see the Mailbox storage limits section in Exchange Online Limits and Assign or unassign licenses for Office 365 for business. 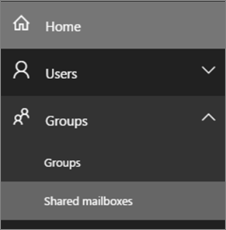 Navigate to Groups > Shared Mailboxes. On the Add a mailbox page, enter a name for the shared mailbox. The wizard will choose a default email address, but you can edit, and choose another email address for the shared mailbox. Click Add. It may take a few minutes before you can add members. Under Next steps, choose Add members to this mailbox and select the members to add. Once you're done adding members, click or tap Save. On the Shared mailbox page, click the mailbox to View details to edit settings on your shared mailbox. Email alias You can changed the primary email address for the shared mailbox by adding another alias and setting it as primary. Email forwarding Switch the slider to On and enter a forwarding email address. Automatic replies Create Out of Office messages. You can send to automatic replies only to senders in the mailbox's contact list or you can send to all external senders. Email apps Choose the apps the user can use to access their Office 365 email. Exchange settings Edit Exchange settings. Click or tap X when you're done. After you create a shared mailbox, you can add new members or remove existing members whenever you want. Select the shared mailbox you want to edit and click or tap Edit next to Members. To remove people from the shared mailbox, click or tap the x or Remove, to the right of their name to remove them. To add another person, type the name of the person you want to add to the shared mailbox, and select them to add them to the list. Click or tap Save when you're done.